Each year for my birthday Nate buys me a cake called the Viking from Extraordinary Desserts in San Diego. I’m pretty sure this cake was the actual ambrosia of the gods on Mt. Olympus. IT IS SO GOOD. Also, I will never make this cake in its entirety. I have the Extraordinary Desserts cookbook (now out of print) and the cake requires SIX(!!!!!) separate recipes in order to make the entire thing. Yeah, not gonna happen. I am perfectly happy waiting for September to roll around each year in order to indulge in the goodness that is the Viking. That said, for Nate’s birthday I wanted to make something decadent and delicious. I decided to cut down the original Viking recipe and just use three of the elements, rather than all six. The final product was awesome. Nate couldn’t believe how much his birthday cake tasted like the Viking, so we named it the Viking Lite. While the Viking Lite is a bit of a labor of love it is totally worth it…and much less a labor than the original recipe! The Viking Lite is made up of layers of chocolate sour cream cake and semisweet ganache, then coated in crushed chocolate praline. When I made the cake I only put the praline on the outside of the cake but we decided a layer of the praline inside the cake would have made it even better. I had leftover praline so we would just sprinkle it on each of our slices. Also, I recommend splurging for high-quality chocolate, like Guittard brand (they make baking chocolate and cocoa powder). Good-quality chocolate really will make a difference in your final product. Based on the original Viking cake created by Karen Krasne of Extraordinary Desserts. Her cookbook is now out of print. I am sharing only the parts I used of the original Viking recipe below, along with my notes and modifications. Put the chocolate chips in a medium, heatproof mixing bowl. Bring the cream to a boil in a small, heavy saucepan over medium-high heat. Pour the hot cream over the chocolate and let sit for 5 minutes. Using a rubber spatula, stir slowly and gently in a circular motion until the chocolate is melted and the mixture is fully combined. 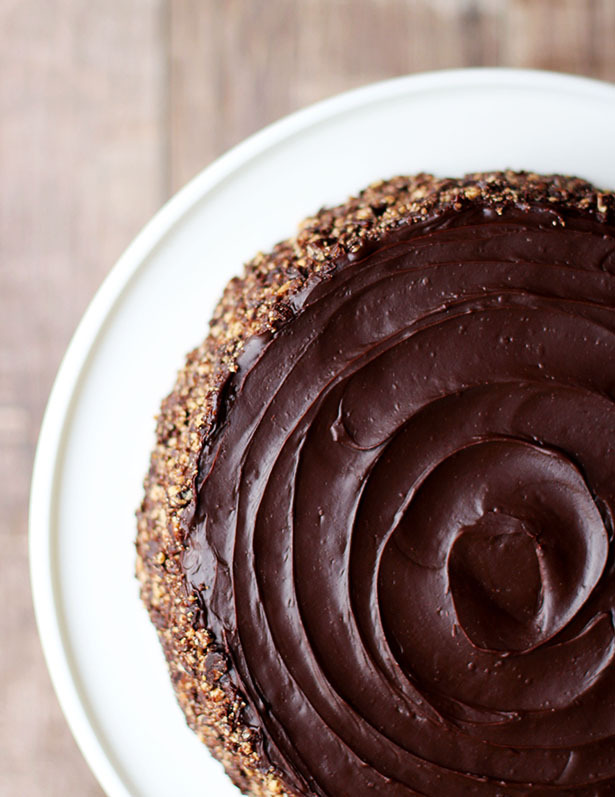 Set ganache aside for later. You will want the ganache to be thickened and at a spreading consistency when it's time to assemble the cake. I put mine in the fridge, covering the bowl with plastic wrap, and checked it every half hour or so, stirring it each time. Generously coat a baking sheet with oil or line with a silicone baking mat (I highly recommend using a Silpat or similar mat if you have one). Toast almonds on another baking sheet in a 350ºF oven for 5-10 minutes, until golden brown. Remove from oven and set aside. Bring milk, butter, corn syrup and sugar to a boil in a medium, heavy saucepan. Insert a candy thermometer or instant-read thermometer and cook over medium-high heat until the mixture reaches 310ºF, about 7-8 minutes (I think it took a little longer than that for me). The mixture should be thick and have started to lightly color. Remove the pot from the heat and set the thermometer aside. Using a rubber spatula, carefully spread the hot mixture onto your oiled or Silpat-lined baking sheet, making sure the mixture is spread into an even layer. Set aside to cool. Once praline is completely cool and hardened, either blast it in a blender or food processor or place in a ziploc bag and hammer with a meat pounder on a wood cutting board, breaking the praline up into small bits. Preheat oven to 275º F. Grease bottom and sides of two 8-inch or two 9-inch round cake pans with butter. Place a parchment round the size of the bottom of the pan in each cake pan, butter the top of the parchment, then lightly flour the pans. Set aside. Place chocolate in a heatproof mixing bowl. Bring a pot of water to a simmer, place bowl on top of the pot (do not let bowl touch water surface), and melt chocolate, stirring occasionally. In a small mixing bowl, whisk together the flour, baking soda and baking powder. Set aside. In the bowl of a stand mixer with the whisk attachment, whip the eggs and sugar at medium-high speed until the mixture is very thick and light in color, about 7 minutes. Add the cubed butter and then the sour cream, mixing until full incorporated after each addition, scraping down the sides of the bowl as needed. Pour in the melted chocolate and mix until fully incorporated. Scrape down the sides of the bowl. Add the dry ingredients and mix on low speed, just until fully incorporated, being careful not to over mix. Bring water to a boil then add to the batter. Mix on low to medium speed until full combined and smooth. Batter will be much thinner after the addition of the water. Pour the batter into the prepared cake pans, dividing evenly. Place pans in the center of the oven and bake until cake springs back slightly when pressed in the center and a cake tester comes out clean. Bake time could be up to 60 minutes, but start checking around 40 minutes for doneness. Remove cakes from the oven and allow to cool completely in the pans sitting on a cooling rack. Once completely cooled, run a thin knife around the edges and invert pans, carefully knocking the bottom of the pan if cake doesn't fall out immediately. Cakes can rest on the cooling rack until you are ready to place them on the cake platter. Remove parchment from bottom of cakes. If you are not immediately assembling the cake, wrap the cakes individually tightly in plastic wrap and refrigerate, but cake can also remain wrapped at room temperature for up to 2 days. Place one of the cakes on your serving platter. Place pieces of waxed or parchment paper under the edge of the cake all around. This will prevent icing from getting on your serving platter as you decorate the cake. Coat top of the first layer of cake with a nice thick layer of ganache. Optional (but recommended! 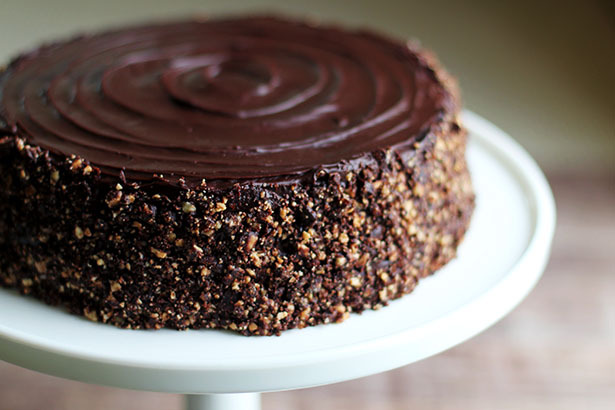 ): Add a layer of the chocolate almond praline layer on top of the ganache. Add the second cake layer. 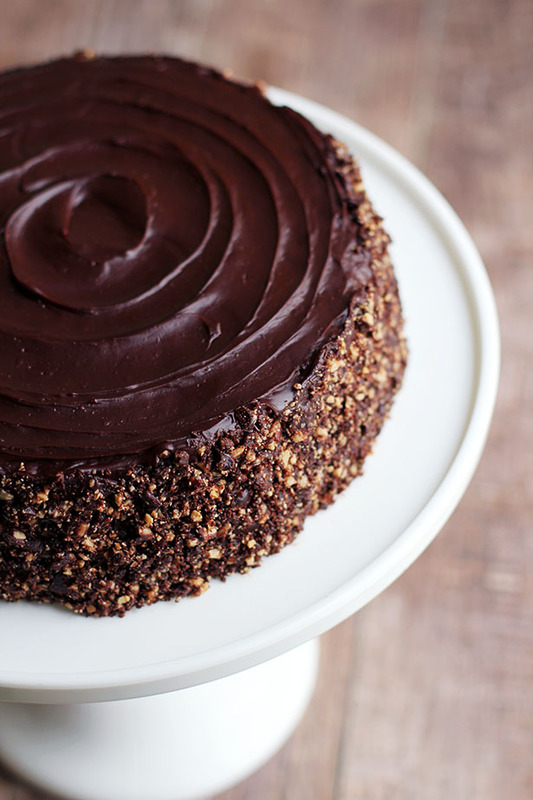 Spread a ganache layer on top, then frost the sides of the cake with the ganache. Once you have finished icing the sides with ganache, using your hands press the praline pieces on the sides of the cake all the way around to coat the sides of the cake. Carefully remove wax/parchment paper, using a knife to hold the frosting in place as you pull out the paper in spots where it gets stuck. If you did not put a layer of praline inside the cake, reserve the extra praline and sprinkle on each cut slice when serving.